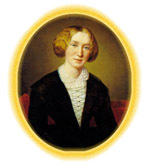 Several biographers - among them Oscar Browning (1890), Blanche Colton Williams (1936), Gordon S. Haight (1968), Ruby V. Redinger (1975) - in referring to this gift have followed Cross in stressing its obvious importance to George Eliot, but it is from the frustratingly incomplete details provided by Cross in his Life (1885) that we have had to construct our idea of the book's nature and contents. Naturally, the biographers have attempted to give their personal stamp to these details, and in two cases (Williams and Haight) have in the process succeeded in adding little inaccuracies. It seems quite clear that they have all relied on Cross's description, and not on their own perusal of an actual volume - and so a work that had meant so much to George Eliot, that must in some way have influenced her, has failed to gain substance. About twenty years ago, however, the Beinecke Rare Book and Manuscript Library at Yale University added to their collection George Eliot's own copy, which Professor Haight then described as a "remarkable association" book; "a slender volume of twelve poems with a copperplate engraving for each. "1 But, except for the important fact that the book is a collection of poems, and the relevant fact that the illustrations are copperplate engravings, this description tells us little beyond what we knew before it was acquired by Yale. Its primary' 'association" had already been indicated by George Eliot herself in the inscription quoted by Cross (and reproduced here), who also gave us the date of publication; but matter, style, and quality - all the elements that might help us to understand why she cared for it - remain elusive.